The beauty brand Lancaster was founded when an industrialist and a chemist predicted an emerging trend in the late 1940s: the return of female skincare. More than 70 years later, the brand continues to be at the industry’s forefront. Part of Coty, the global beauty group, Lancaster collaborates with Swaven to boost the performance and the profitability of its digital marketing campaigns. With the summer at the doorstep, the brand has launched a new shoppable website and several shoppable videos for its sun care products. Swaven’s multi-retailer POP (Point Of Purchase) solution allows Lancaster to accelerate the purchase path, to increase qualified leads to its resellers online and offline, and to boost sales. In addition to Lancaster, Swaven’s unique in-video technology and efficient multi-product and multi-retailer formats have already convinced several other Coty brands such as Chloé, Hugo Boss and Bourjois. 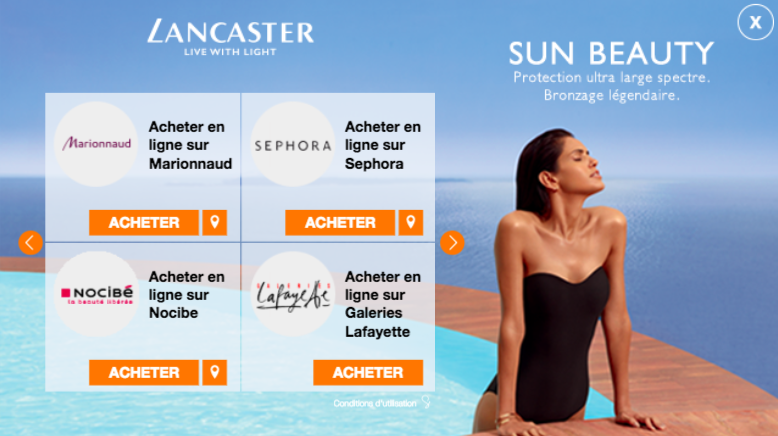 Lancaster’s new videos in France are equipped with Swaven’s shoppable in-video technology that allows a seamless viewing experience. A call-to-action ‘buy now’ button appears, and by clicking on it, a list of retailers selling the product is displayed directly in the video ad space instead of another link or a separate window. With another click, the user gets directed to the product pages of his/her chosen reseller to finalise purchase online or checks the itinerary to the closest physical store. The brand keeps control of the purchase path and avoids losing the audiences interacting with them. Consumers visiting Lancaster’s website for information now have the possibility to also check where their desired products are available for purchase online and offline based on their geographic location. A click on a call-to-action button displayed at the end of each product description opens a pop-in window while the brand’s website remains active in the background. From within this window consumers have the option of exploring a range of products by scrolling through a carousel. An image and a short description of each product are displayed alongside a list of retailers. The order of display can be customised according to the brand’s preferences and strategy. For online distributors the customer is presented with a ‘Buy’ button which links directly to the appropriate page on the retailer’s website from which the product can be purchased with a minimal number of clicks. The brick-and-mortar retailers can be discovered from a ‘Find’ button which allows consumers to see an itinerary to the shop of their choice. By tracking the shopper paths on Lancaster’s website and their videos, the Swaven solution gathers valuable data that allows the brand to measure the effectiveness of their marketing campaigns by acquisition channel, by product, by reseller etc. This in turn helps the brand to develop their marketing strategy and campaigns. Swaven’s POP solutions can be adapted to any digital medium. Deploying the solution across a range of channels (website, social media, banner advertising, mobile applications, videos…) offers not only the advantage of increased user engagement but also allows the individual branding tools to communicate with one another to provide a more sophisticated customer experience. Contact us to find out how you can optimise the customer experience on your website, create a sales funnel that spans from your online presence to your offline distributors while also gaining valuable insights into where your customers come from, what they want, and where they go.